Back in '84 there were no professional recording studios in Blackpool. With the rise of new upcoming artists in a time of new wave music, we saw the need to design & build a dedicated recording studio that rivalled the very best.  With over 35 years in the business our studio has produced hundreds of albums, thousands of singles, and is the recording studio of choice for serious artists looking for professional results. Berlin Studios has a legacy unmatched by any other studio in the area. We are home to some of the very best producers & audio engineers in the UK, such as Phil Harding, Tim Duncan & James Routh. BBC Radio 2, SKY, ITV, Channel 4, Ragdoll Productions & Lionsgate Studios.